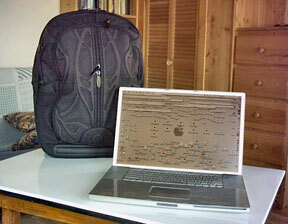 OWC blogger Benjamin says that as a 17" MacBook Pro user, he's searched far and wide for the perfect attaché case. He allows that he's quite demanding on what his computer cases look like and function, with overall fit, finish, and function are all extremely important. He's used a wide variety of styles and has been seeking the perfect mix of style, function, and price in the wilds of eBay, the "one size fits all" PC sites, and even trudged to some place called a "store" with has wife. Benjamin observes that the world seems stuck on the idea that everyone has a 15" laptop, which meant his results for the 17-incher were limited. He says he found his "perfect" bag, but it cost $400, so the quest continued. Benjamin says that after all that criteria and searching he found the perfect bag at employer OWC - the $77.99 Kensington Contour Pro 17" Notebook Carrying Case, noting that "At under $100, the price is a steal for something with this much craftsmanship and functionality." I haven't used the Kensington Contour Pro, but I'm a fan of Kensington products (their SlimType keyboard is at the top of my hit parade), which usually offer excellent value for the money. However, there are other excellent 17" MacBook/PowerBook cases, such as the concededly more expensive but very stylish Waterfield Racer-X that I toted my 17" PowerBook around in for several years. 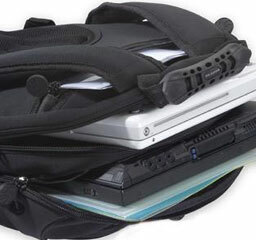 However, I'm somewhat partial to computer backpacks, especially for longer jaunts than from-house-to-car-to-destination and vice-versa. The SLAPPA V2 Velocity Spyder Pro Laptop Backpack is the most commodious laptop backpack that I've yet encountered, as well as having excellent construction and materials quality, and yet it is still surprisingly light. The first thing that impresses you about it is its unique styling. 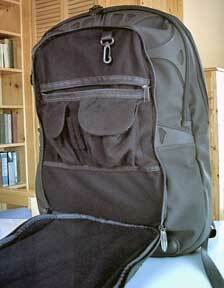 The second will likely be the sheer volume of capacity this bag contains. This bag features SLAPPA's patented CORE3 protection, which utilizes a thick rubber exoskeleton plus hydro-repellant and puncture proof BuckBlast suede plus Xtreme internal padding. CORE3 is SLAPPA's patented protective triple-layer that provides unparalleled protection. The outermost layer is a molded rubber exoskeleton that provides protection from bumps while also keeping the structural integrity of the bag, layer #2 is the puncture-proof BuckBlast z-suede, and the inner layer is Xtra thick shock padding. BuckBlast suede is an extremely rugged PVC material that is rain-proof and puncture-proof, providing secure protection for all your gear when you're on the road. It is very easy to care for and can be easily cleaned with water and a soft cloth. But I'm getting ahead of myself. Starting at the outside front and working our way in, the SLAPPA V2 Spyder's front panel with that rubbery molded exoskeleton appliqué has a central pocket with a vertical, double-zipper opening. As with all (save one) of the rest of this bag's internal compartments, the pocket is lined with a wonderfully soft jersey tricot fabric lining that will be very kind to your computer and other stuff. 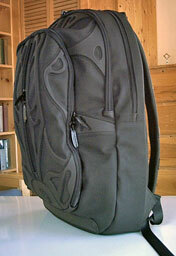 There are also two elastic-closure pockets flanking the front panel. Immediately behind the front panel pocket is the first of - count 'em - four full-depth gear compartments. This frontmost of the four unzips on three sides with an internal zipper-closure pocket on the backside of the front panel, another on the compartment's rear bulkhead, plus Velcro-closure expander pockets and a handy swivel key fob sewn to the case with nylon webbing. Oh yes, there are a couple of pen/pencil sleeves as well. The middle compartment has no zip or Velcro closure pockets, and indeed just one small, open-net pocket toward the bottom of the yawning cavern. This is the compartment for your largest, bulkiest stuff, and there is plenty of space (and then some) to carry a second laptop in there if necessary. 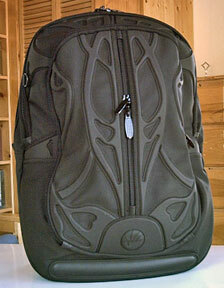 The third compartment has the previously described computer sleeve, plus by another full-depth cave that looks bottomless. It really is a long reach to the bottom. "Roomy" is not adequate to describe it. 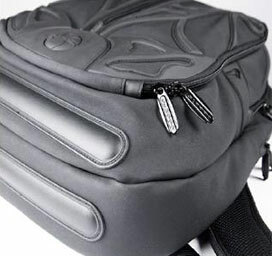 And for good measure, there is yet one more full-depth compartment, accessed in this case through a zipper closure at the top of the Spyder Backpack's back panel. Unlike the others, this compartment is lined with a stay cool inner lining for storing cold goods, rather than the jersey fabric. On the back outside panel is a foam pad that contacts the small of your back - molded in the shape of SLAPPA's stylized open-hand logo. Different and striking. And we're not quite finished with pockets yet. There is one more small external compartment that fastens to the front of the right-hand shoulder strap and is sized to hold an iPod or cell phone. It has a Velcro-closure flap that allows an iPod earphone cord to be connected with the 'Pod in situ and the flap fastened. The pocket is lined with soft jersey. The shoulder straps are robust (rated for fifty pounds pack weight), comfortably padded with foam, and faced with nylon mesh on their contact surfaces. Oddly, there is no belly strap, but the shoulder straps can be adjusted snugly, and the sheer length of the backpack stabilizes it. 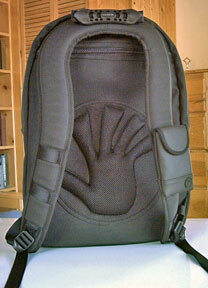 Another thoughtful touch is a carry handle with a rubber comfort handgrip sewn to the top of the bag for easy one-handed carriage without resorting to the shoulder straps. The bag's zippers all have a reassuring feel, and the metal zipper pull-tabs are generously-sized and have both the look and feel of quality. While my description probably makes the SLAPPA V2 Spyder Laptop Backpack sound enormous and ungainly, it is actually surprisingly light in weight at a modest 3.9 pounds, and it doesn't give the impression of great bulk outside. Overall, this backpack is an impressive piece of work, with the flamboyance of its unusual styling balanced by its subdued charcoal color. It is attractive and classy-looking without being garish or overstated, and the quality of materials and workmanship appear to be first rate. At a list price of $109.99 (currently on sale for $99.99), the SLAPPA V2 Spyder Laptop Backpack isn't cheap, but I've not encountered anything quite like it. If you need a computer backpack that can comfortably swallow a 15" notebook along with a lot of other gear, this is one you should really have on your short list. 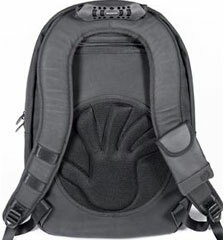 The Velocity Spyder Pro Laptop Backpack is available in Black Spyder - Graphite Matrix and sells for $89.99 (15.4" version) and $99.99 (17" version). Rating: 3.5 out of 4. Xtreme padded, comfort - collar backpack straps tested to 80 lb. 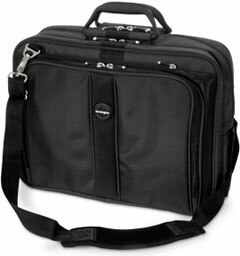 Large padded inner laptop sleeve able to accommodate laptops with screens up to 17"
Ideal for standard-sized laptops up to 17"